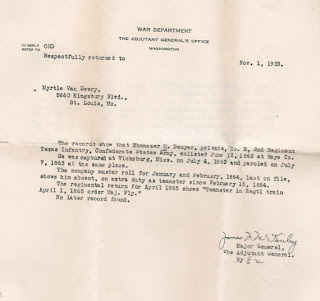 Will you please advise me whether or not your office has a record of the service performed by my maternal grand-father, Ebenezer Opham Denyer, in the Confederate Army? 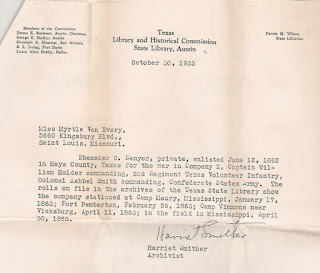 According to our family history, “Ebenezer Opham Denyer joined the 2nd Texas Company Volunteers at San Marcos, Hays County, Texas in the summer of 1861 and served throughout the war. 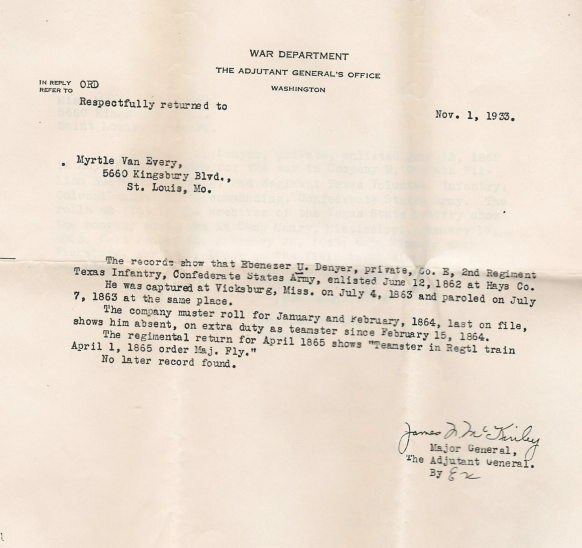 He was taken prisoner, exchanged, but was forced to remain in a hospital until the close of the war.” His discharge papers have become lost, and we should like very much to get documentary evidence that he served in the Confederate Army. My grand-father married Sarah Ann Hartley, and my mother was Margaret Jane Denyer, their second child. My mother married Melvin E. Van Every. 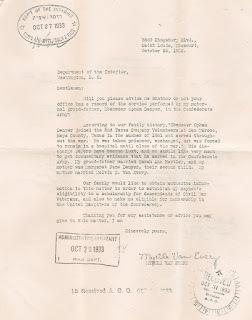 Our family would like to obtain authentic information in this matter in order to establish my nephew’s eligibility to a scholarship for descendants of Civil War Veterans, and also to make me eligible for membership in the United Daughters of the Confederacy. The records show that Ebenezer U. Denyer, private, Co. E, 2nd Regiment Texas Infantry, Confederate States Army, enlisted June 12, 1862 at Hays Co. He was captured at Vicksburg, Miss. On July 4, 1863 and paroled on July 7, 1863 at the same place. The company muster roll for January and February, 1864, last on file, shows him absent, on extra duty as teamster since February 15, 1864. Ebenezer O. Denyer, private, enlisted June 12, 1862 in Hays County, Texas for the war in Company E, Captain William Holder commanding, 2nd Regiment Texas Volunteer Infantry, Colonel Ashbel Smith commanding, Confederate States Army. The rolls on file in the archives of the Texas State Library show the company stationed at Camp Maury, Mississippi, January 17, 1863; Fort Pemberton, February 26, 1863; Camp Timmons near Vicksburg, April 11, 1863; in the field in Mississippi, April 30, 1863. 1) The information the War Department provided, naturally, matches the documents I downloaded from Footnote (now Fold3) several years ago. 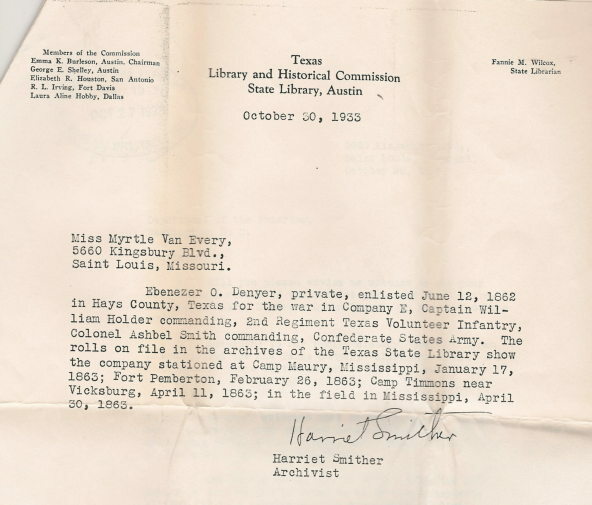 However, the Texas Library and Historical Commission State Library provided some details of where the company was stationed on certain dates. 2) The "family history" my grandmother refers to is clearly A Brief History of John and Christian Fretz and a Complete Genealogical Family Register With Biographies of their Descendants from the Earliest Available Records to the Present Time – by Rev A.J. Fretz of Milton N.J. copyright 1890. Mennonite Publishing Co. Elkhart, Indiana. The quotation matches the bio provided for Ebenezer. She didn't save a copy of the entire book, but I believe I've seen some photocopied pages. Likely the same ones I transcribed here. 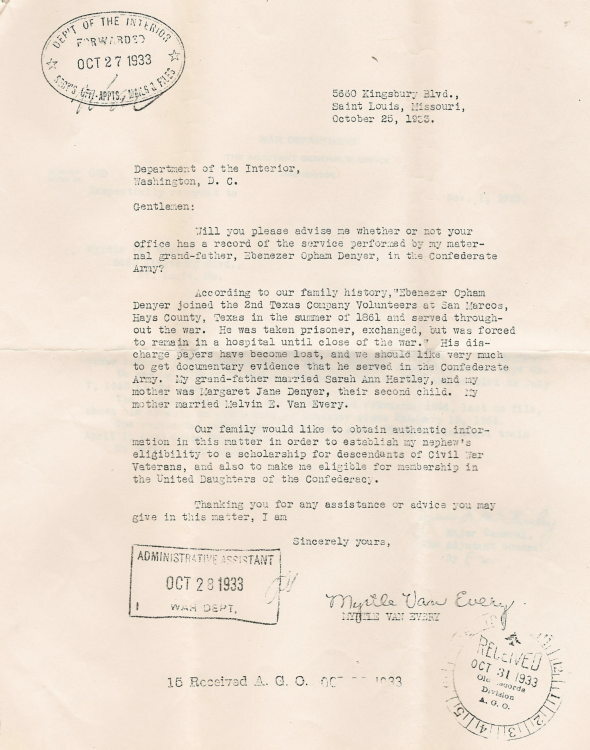 3) I am unsure if my grandmother joined the United Daughters of the Confederacy, or if her nephew received the scholarship, though the letters should have provided the documentation they needed. My grandmother only had two nephews alive in 1933 - one was 17 and the other 22.